Rick Hergott of Hergott Trading Company is a man who’s as serious as a sea bass about things that swim. In other words, this guy is no fluke. Nor were the fish dishes we tasted with him the other day at Postrio — all prepared to a turn by Executive Chef Mark Sandoval — each done simply to highlight the quality of the main ingredient. Hawaiian bigeye tuna, highly prized by sashimi lovers for its higher fat content, needs little more than a light sear, and that’s just what Sandoval gave his — along with a light dusting of sesame seeds. Our sea bass (lavraki in Greek, loup de mer in French) was served first as sashimi, then roasted, again to demonstrate the quality and freshness of the ingredient. Delivery orders and faxes have now all been replaced by streams of e-mail, and this fishy river of commerce flows back and forth constantly — with the boats telling Hergott what they’ve got, while the restaurants are communicating to him what they need. None of this deliciousness would be possible without air freight, and ELV thinks every great restaurant in town should have a tiny FedEx creche somewhere on the premises. Vegas’ carbon footprint may always be Sasquatch-ian, but then again, when it comes to fish like this, so is Chicago’s. Because of Hergott and his ilk, we now take fresh, out-of-the-sea-less-than-24-hours-fish for granted…something ELV would not have thought possible ten years ago. BTW: We also learned something else at Postrio that day — its $54 sea bass for two is a flat-out steal, especially when compared to some of the prices charged by other top flight fish emporiums. Hergott Trading Company picked up the check. Thanks Rick! Postrio???? Really ELV??? The above stated is cool and all BUT A COMPLETE WASTE. So many better fish joints then Postrio. You know it, I know it and we all know it. Glad you got off the rm seafood jock and tried MILOS because THAT is the best seafood du jour. Stray from the norm and give American Fish & Aquaknox their due. I’d suggest holstering those PR pieces and be a “critic” in 2011. Regurgitating the same 4 band all-stars piece from Comme Ca’s …..You, Al, Gladstone, Jacobson. Grow a set dude……. Thanks for the review ELV. It’s interesting to hear about what takes place behind the scenes to deliver fresh seafood to our plates and I appreciate the fact you reported on Postrio–it’s a great option for people who are staying at the Venetian/Palazzo empire and don’t have the time or expense account to head over to Bartolotta at Wynn and sample Paul’s Medittereanean sea creatures. I also know that in order to be successful, i.e. the bottom line, that the sea bass served gratis to a VIP or food writer is no better, (or worse), than the sea bass served to any patron at Postrio. The goal of a great restaurant is to serve consistently high-quality dishes to everyone, including an ordinary, middle-aged Mom. Every time I hear ‘sea bass’ I think of Nick & Nora Charles ordering dinner. It hardly deserves addressing, but Fishmonger is just a hater. An uninformed hater at that. If you read ELV, one would know he has reviewed the other fish fancy restaurants and this review tackles exactly the task you ask of him and then some. What’s with the vitriol? “Grow a set…”? Of what? Tonsils?! ELV takes on anyone with unabashed, and un-PR like tones (but he can always turn a great phrase) unlike any other critic. And critique he does quite well for all of us to enjoy. 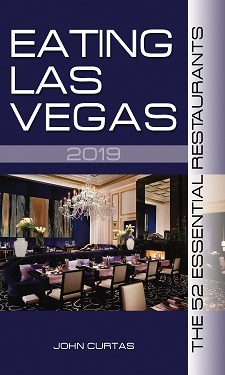 ELV responds: while we fully admit to getting better service than most in LV restaurants, we can assure you that the food we eat (and photograph) is substantially the same as what everyone else is getting on the night we are there. At most, a kitchen might take a tiny bit more care with the plating of our dish, but the recipe is the same. ELV, I love reading your reviews. I work in the seafood business down here in Los Angeles. I would like to make myself available to you at anytime should you need any information on fresh seafood logistics, production, sustainability, or any other subject. Our company is involved in your market, and I would be pleased to share with you any knowledge/information I could provide, anytime you would like.